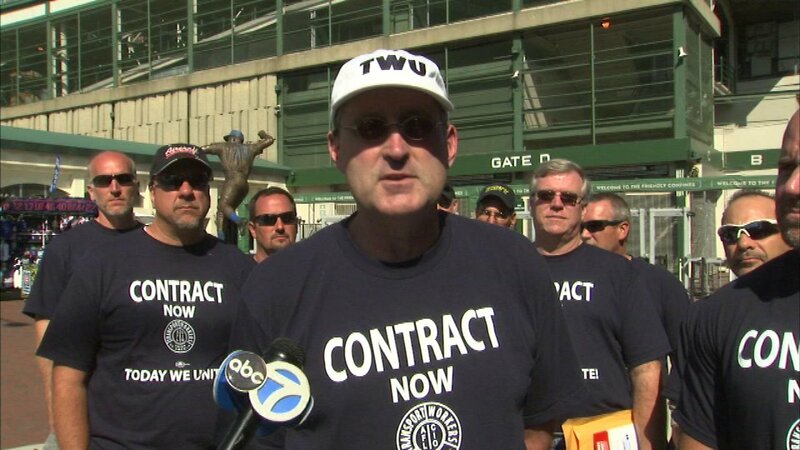 CHICAGO (WLS) -- American Airlines mechanics and fleet service workers protested Sunday outside Wrigley Field, demanding a fair union contract. The protest took place outside Wrigley because American Airlines is the official airline of the Chicago Cubs. Negotiations between the Transit Workers Union and the airlines have stalled. Workers claim American Airlines plans to outsource more maintenance work to vendors outside the United States, including to Brazil, to increase profits. "They want to outsource a bunch of our de-icing work, the baggage handlers that de-ice your aircraft. And we want to make sure the public understands that we are the best and safest and most trained employees in the industry," said Timothy Murphy, union president. The union says they "have made countless sacrifices while the company continues to make record profits. We've been through bankruptcy, a merger, and stagnating wages." In a statement, the airline said: "American is proud to employ more maintenance and fleet service team members, and do more maintenance and fleet service work in-house, than any other U.S. airline. That's the case today and will remain the case under the proposal we have presented to the TWU-IAM Association. We're incredibly thankful for our skilled and well-trained team and want to get them an industry-leading contract as soon as possible. We look forward to the Association's response to our comprehensive proposal we offered last month."